Fulein: Each unit has different [SKILLS], and you can keep advancing in the game by using them effectively. Macaron: But how do you find out what skills they have? You can check in the unit's "Tsuyosa" ("強さ") screen. Harpy has the skill "Paralysis Addition"! Isn't there a skill called "Paralysis Addition"? The Harpy has this skill and can paralyze enemies with it. Heh~. When it's paralyzed, it can't do anything, right? That's not very strong. That's right. But you can only use the skills under certain [CONDITIONS]. 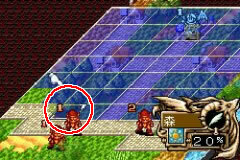 Unless the elemental attribute of the unit and the elemental attribute of the land on which the unit is standing are the same, you can't use the skill. So you can't use it whenever you like. Isn't the Harpy's attribute "wind"? That's how it is. 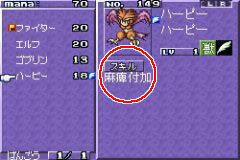 If you've forgotten what the unit's attribute is, you can check the space below and to the right of its name on the "tsuyosa" screen. So, next we need to check the attribute of the land. 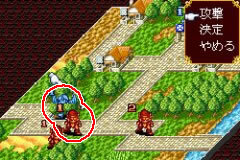 area by putting your cursor over it! Put the cursor over the land and you will see the [LAND ATTRIBUTE]. The mark in the lower-right. You can see that the forest has the "Wind" attribute. 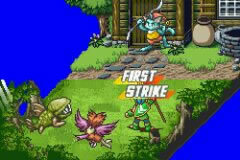 The Harpy has the same attribute. Yeah. That's right. 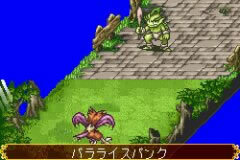 Therefore, if the Harpy fights in the forest, it can use "Paralysis Addition." Moving to the forest allows use of special skills! We'll try attacking. Moving to the forest, the opponent is a Goblin! 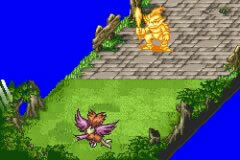 Harpy's special skill "Paraly Spank" is a paralyzing attack! Attack success! The Goblin is paralyzed and can't move! Ah, the Goblin is paralyzed! We did it! Yeah, we did it. The goblin can't counterattack or even attack in the Enemy [TURN] until it recovers in a base. After unity parties, the [PARTY LEADER'S ATTRIBUTE] matches the land attribute, everyone in the part will be able to use their skills. a skill because the group leader's is "wind." Ah, the fire-elemental Soldier can use a skill in the wind-elemental forest. Yeah. That's because the wind-element Harpy is the leader. All three people can use their skills; you should have remembered something so important.